The Apostles share a meal with Jesus during the Last Supper. Each Apostle here is represented with a halo (along with Jesus) except Judas Iscariot, the betrayer. Painting by Simon Ushakov. In Christianity, an Apostle (Greek: Ἀπόστολος apostolos: meaning "messenger") designates an individual commissioned by God to spread the "good news" of the Christian message to the people of the world. Normally, the term applies to one of the Twelve Apostles listed in the New Testament, who were chosen by Jesus to heal the sick, drive out demons, raise the dead, and spread the gospel (Mark 6:7-13; Matthew 10:5-42; Luke 9:1-6). The status of the apostles in the early Church was penultimate to Jesus himself, for Jesus had given them the power to teach in his name. Many Christian churches still base their authority on the premise of Apostolic Succession (ecclesiastical authority derived from being founded by an apostle). Nevertheless, the lists of the apostles in the Bible have slight variations, and biblical accounts suggest some disagreement among these figures. In addition to their aforementioned roles, Apostles were also attributed with writing Gospels (both Cannonized and Gnostic), and many pseudopigrapha works were written in their names. Hence, distinct Gospels of Peter and Thomas (among others) once existed, though these works were later rejected as non-canonical. The word apostle comes from the Greek term ἀπόστολος (apostolos), which means one who is sent on a mission, a commissioned representative of a congregation, a messenger for God, or a person who has the special task of founding and establishing churches. Thus, the Greek word apostle had two primary uses: in its original broad context, it meant a messenger, but after the advent of Christianity, the word was also used in a narrower way to refer specifically to one of the Twelve Apostles linked to Jesus Christ. The generalized meaning of apostle as anyone who was an envoy or missionary, has been lost today except in cases where the term is translated into Latin by the word missio, from which we get the word missionary. For many of Christians today, the word apostle is restricted to the Twelve Apostles, and some are offended by those who call themselves apostles. While it is not linguistically wrong for people to take the ancient Greek meaning and call themselves apostles today, it does miss the important fact that languages change through time, and calling oneself an apostle today is, to many people, implying that one is making oneself equal to the original Twelve Apostles. This modern use has been a gross offense to many and a cause of much misunderstanding among Christian groups. Some churches which use the word apostle frequently, recognize this dilemma and so call contemporary church leaders apostles with a small "a" reserving the capital "A" for the Twelve Apostles. Although the Apostles are portrayed as having been Galilean Jews, and ten of their names are Aramaic, the other four names are Greek, suggesting a more metropolitan background. Consequently, many churches use culturally more appropriate terms to avoid any controversy, such as missionary, envoy, delegate, messenger, church planter, church founder, etc. Simon: called Peter (Grk. petros, petra; Aram. kēf; Engl. rock) by Jesus, also known as Simon bar Jonah, Simon bar Jochanan (Aram. ), Cephas (Aram. ), and Simon Peter. A fisherman from Bethsaida "of Galilee" (John 1:44; 12:21). James the Great, son of Zebedee. John: another son of Zebedee, called, along with his brother James, Boanerges by Jesus (an Aramaic name explained in Mark 3:17 as "Sons of Thunder"). Thomas: also known as Judas Thomas Didymus—Aramaic T'om (twin), and Greek Didymous (twin). James: sometimes identified with James, brother of Jesus—"His [James the brother of the Lord] identity with James the Less (Mark 15:40) and the Apostle James, the son of Alpheus (Matthew 10:3; Mark 3:18), although contested by many Protestant critics, may also be considered as certain." Simon the Canaanite: "Some identify him [Symeon of Jerusalem] with the Apostle Simon the Cananean (Matthew 10:4; Mark 3:18) or the Zealot (Luke 6:15; Acts 1:13)." Judas Iscariot: the name Iscariot may refer to the Judaean towns of Kerioth, the sicarii (Jewish nationalist insurrectionists), or to Issachar. He was replaced as an apostle by Matthias. The identity of the twelfth apostle, traditionally called St. Jude, varies between the Synoptic Gospels and also between ancient manuscripts of each gospel. Noticeably missing from the Gospel of John are James, son of Alphaeus, Matthew, and Simon the Canaanite/Zealot. James the Just was, according to the Book of Acts, the leader of the Jerusalem Church, and Matthew is noticeably the most Jewish of the Gospels, and it may be the case that the author of John deliberately left out these two figures for a motive opposed to Jewish Christianity. By the second century, the presence of two Simons in the list of the Synoptic Gospels allowed a case to be made for Simon Magus being the other of the Simons, and hence one of the twelve apostles, and it may have been for this reason that John left the other Simon out. The second Simon may also have been Simeon of Jerusalem, the second leader of the Jerusalem church, after James. The three Synoptic Gospels record the circumstances in which some of the disciples were recruited: Matthew describes the recruitment of Simon, Andrew, James, and John. All three Synoptic Gospels state that these four were recruited fairly soon after Jesus returned from being tempted by the devil. Simon and Andrew were, according to Matthew, the first two apostles to be appointed, and Matthew identifies them as fishermen. Mark does not identify Simon as also being called Peter until a long time after Simon is introduced in the narrative, but Matthew immediately makes the connection as soon as he is first mentioned. This has the effect of changing the later passage where Jesus names Simon as Peter from one where Jesus bestows the name onto Simon into one where Jesus merely starts using a long held nickname. Both Andrew and Peter are names of Greek origin, which some see as a reflection on the multicultural nature of Galilee at this time, although evidence exists that Andrew was used by Jews as a name since at least 169 B.C.E. in the early period of Hellenic influence. (It is also notable that Peter is identified by Paul in his letters as Cephas, which is the Aramaic equivalent of the Greek Peter, both words meaning "rock"). Simon however is the Greek form of the Hebrew name Shimeon, a common Jewish name found referring to several other individuals in contemporary works such as Josephus as well as in the Old Testament. Despite Jesus only briefly requesting that they join him, Simon and Andrew are described as immediately consenting, and abandoning their nets to do so. Traditionally the immediacy of their consent was viewed as an example of divine power, although this statement is not made in the text itself. The alternative and much more ordinary solution is that Jesus was simply friends with the individuals beforehand, as implied by the Gospel of John, which states that Andrew and an unnamed other had been a disciple of John the Baptist, and started following Jesus as soon as Jesus had been baptized. 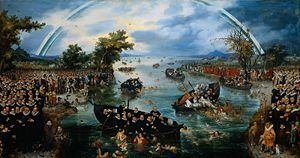 Albright and Mann extrapolate from Simon and Andrew’s abandonment of their nets that Matthew is emphasizing the importance of renunciation by converting to Christianity. Since fishing was profitable, though required large start-up costs, abandoning this profession would have been an important sacrifice. Regardless, Simon and Andrew's abandonment of what were effectively their most important worldly possessions was taken as a model by later Christian ascetics. Furthermore, later in the gospels it is said that Jesus instructs them to "take nothing for their journey, except a mere staff—no bread, no bag, no money in their belt—but to wear sandals; and He added, "Do not put on two tunics," and that if any town rejects them they ought to shake the dust off their feet as they leave, a gesture which some scholars think was meant as a contemptuous threat. Their carrying of just a staff (Mathew and Luke say not even a staff) is sometimes given as the reason for the use by Christian Bishops of a staff of office, in those denominations that believe they maintain an apostolic succession. The synoptics go on to describe that after Jesus had begun his ministry, he noticed a tax collector in his booth. The tax collector, Levi according to some Gospels, Matthew according to others, is asked by Jesus to become one of his disciples. Matthew/Levi is stated to have accepted and then invited Jesus for a meal with his friends. Tax collectors were seen as villains in Jewish society, and the Pharisees are described by the synoptics as asking Jesus why he was having a meal with such disreputable people. The reply Jesus gives to this is now well known: it is not the healthy who need a doctor, but the sick…I have not come to call the righteous, but sinners (Mark 2:17). The phrase fishers of men, used in the Gospels of Mark and Matthew, is how Jesus described the role of an apostle, which may be responsible for the adoption of the Ichthys as a symbol of Christianity. A similar reference to fishing occurs in the Book of Jeremiah (at 16:15), upon which this phrase may be based. Here it is placed in the context of actively hunting down sinners. The phrase has a strong resonance amongst Evangelical groups, who view it as a metaphor for evangelism. It has an even deeper significance for Roman Catholic Christians, who view it not only as a great evangelical call, but also as one of many scripture passages that allegedly support the “Primacy of Peter” as a great sign of unity in the Church and the teaching that the popes throughout the ages are the actual successors of "The Chair (or office) of Peter," as Christ's prime earthly shepherd for each generation, after his resurrection and ascension into heaven. The institution by Jesus of the Twelve Apostles is also seen by Catholics as a reference to the universality of the Church that was prefigured in the Old Testament. Those successors of the Twelve Apostles, the bishops, in union with the successors of Peter, the pope, are collectively called the magisterium of the Church—the official, authoritative teaching office established by Christ himself. The biblical references to the Twelve Apostles as "fishers of men," especially the image of Peter's sole role in pulling the net full of "153 large fish" onto the shore without tearing the net, when all the apostles present could not lift the net into the boat, is suggestive, for Roman Catholics, of Peter's primacy among the apostles (John 21). Saul, later known as Paul, though not one of the original Twelve Apostles, described himself as an apostle to the Gentiles (Romans 11:13, Galatians 2:8), and claimed he was appointed by the resurrected Jesus himself during his “Road to Damascus” vision. He also described some of his companions as apostles (Barnabas, Silas, Apollos, Andronicus, and Junia) and even some of his opponents as super-apostles (2nd Corinthians 11:5 and 12:11). As the Catholic Encyclopedia states: "It is at once evident that in a Christian sense, everyone who had received a mission from God, or Christ, to man could be called 'Apostle'." This extended the sense of the apostles beyond the original Twelve. Since Paul claimed to have received the Gospel through a revelation of Jesus Christ (Gal 1:12; Acts 9:3-19, 26-27, 22:6-21, 26:12-23) after the latter's death and resurrection, rather than before like the Twelve, he was often obliged to defend his apostolic authority (1st Corinthians 9:1 "Am I not an apostle?") and proclaim that he had seen and was anointed by Jesus while on the road to Damascus; but James, Peter, and John in Jerusalem accepted his apostleship to the Gentiles (specifically those not circumcised) as of equal authority to Peter's apostleship to the Jews (specifically those circumcised) according to Paul in Galatians 2:7-9. Many historians maintain that Paul and Peter certainly disagreed on the extent of Paul's authority as an Apostle, with Peter maintaining that Paul was not one of those chosen by Jesus, or was secondary because he was chosen after his death. Nevertheless, the Roman Catholic Church and Eastern Orthodox Church consider Paul an Apostle; they honor Paul and Peter together on June 29. Paul sometimes replaces Matthias in classical depictions of the Twelve Apostles, although he has also been called the "Thirteenth Apostle" because he was not a member of the original Twelve. 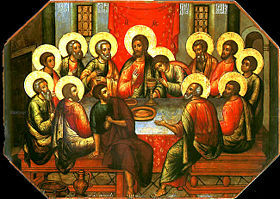 Judas has an ambivalent place in the list of the Twelve Apostles. He was selected by Jesus as one of the original apostles, but he eventually betrayed Jesus. The sources of this betrayal are a cause of considerable debate. Some say that he was acting as an agent of Satan, while others say that he was following Jesus's own wishes. It appears that Judas was once highly esteemed among the Apostles. According to Acts 1:16–20, Peter states, "Judas, who was guide to those who took Jesus….For he was numbered with us, and received his portion in this ministry….For it is written in the book of Psalms, 'Let his habitation be made desolate, Let no one dwell therein’, and, 'Let another take his office’." However, despite his initial promise as an Apostle, Judas’s sinful nature caused him to betray Jesus. One Gospel account says that, after realizing his mistake, Judas committed suicide. He was replaced as a member of the Twelve Apostles by Matthias. Between the ascension of Christ and the day of Pentecost, the remaining Apostles elected a a replacement for Judas by casting lots, a traditional Jewish way to determine the “Will of God.” The lot fell upon Matthias, who then became the last of the Twelve Apostles in the New Testament. This is one of several verses used by the Roman Catholic Church to defend its teaching of apostolic succession—that each of the Twelve Apostles had an office and a successor (the bishops). Also intimately connected to the Catholic teaching of apostolic succession is the papacy—the teaching that Peter, the "rock," (Matthew 16:18-19) was the "prime apostle"—the first pope—and that after his death, successors to his “chair" (referring to his office as pope, "prime minister") would take over his role as universal shepherd of Christ's flock. An important figure in the Gospel of John is mysteriously referred to as the disciple "whom Jesus loved." It is not known exactly who this beloved disciple was, but some suggest that it may have been John himself. Others have speculated that it may have been Mary Magdalene. The writer of Hebrews 3:1 refers to Jesus as the "apostle and high priest of our professed faith" and of rank greater than that of Moses. In Acts 14:14, Barnabas, the man who introduced Paul to the circle of disciples and the Desposyni at Jerusalem, is referred to as an apostle. Brother or relative of Jesus, described by Paul as "James, Cephas, and John, who were reputed to be pillars," (Galatians 2:9 NIV) and described in Acts as leader of the Jerusalem Church, is not called an apostle in the Gospels, though Paul states in Galatians 1:19 that he is one and according to Orthodox Christian Tradition he is the first of the Seventy of Luke 10:1-20. Many believe that the Seventy were also called apostles. The Greek text does not use the noun form apostolos but uses the verb form apostello which means “to send away” and in combination with the rest of the text strongly implies that they are apostles. In Romans 16:7, Paul states that Andronicus and Junia were "of note among the apostles," indicating that he considered these two to be well-known to the apostles. Little evidence points to Junia being a woman; nonetheless, this is cited as an example of gender neutrality in the early church. They were of note among the apostles, not so much perhaps because they were persons of estate and quality in the world as because they were eminent for knowledge, and gifts, and graces, which made them famous among the apostles, who were competent judges of those things, and were endued with a spirit of discerning not only the sincerity, but the eminency, of Christians. The Roman Emperor Constantine the Great formally recognized Christianity in the Roman Empire in the Edict of Milan in 313 C.E. According to Philip Schaff's History of the Christian Church: "Soon after his death, Eusebius set him above the greatest princes of all times; from the fifth century he began to be recognized in the East as a saint; and the Greek and Russian church to this day celebrates his memory under the extravagant title of "Isapostolos," the "Equal of the apostles." The Latin church, on the contrary, has never placed him among the saints, but has been content with naming him "the Great," in just and grateful remembrance of his services to the cause of Christianity. In the Acta Sanctorum ad 21 Maii, p. 13 sq., Niebuhr remarks, "When certain oriental writers call Constantine ‘equal to the Apostles’, they do not know what they are saying; and to speak of him as a ‘saint’ is a profanation of the word." In the Orthodox Church, the saint prince Vladimir of Kiev and Cyrilland Methodius are also called "equal to the Apostles." Some Eastern Orthodox saints are given the title specific to the Eastern rites "equal-to-the-Apostles." The myrrh-bearing women, who went to anoint Christ's body and first learned of his resurrection, are sometimes called the "apostles to the Apostles" because they were sent by Jesus to tell the Apostles of his resurrection. A number of successful pioneering missionaries are known as apostles. In this sense, in the traditional list below, the apostle first brought Christianity (or Arianism in the case of Ulfilas and the Goths) to a group of people. Or it may apply to the truly influential Christianizer, such as Patrick's mission to Ireland, where a few struggling Christian communities did already exist. Apostle to the Abyssinians: Saint Frumentius. Apostle to the Caucasian Albania: Saint Yelisey came from Jerusalem in the first century C.E. Apostle of the Alleghanies: Demetrius Augustine Gallitzin, 1770–1840 C.E. Apostle of Andalusia: John of Avila, 1500–1569 C.E. Apostle of the Ardennes: Saint Hubertus, 656–727 C.E. Apostle to the Armenians: Saint Gregory the Illuminator, 256–331 C.E. Apostle to Brazil: José de Anchieta, 1533–1597 C.E. Apostle to Karantania: Bishop Virgilius of Salzburg, 745–784 C.E. Apostle to the Cherokees: Cephas Washburn. Apostle to China: Hudson Taylor. Apostle to the Franks: Saint Denis, third century C.E. Apostle to the Franks: Saint Remigius, 437–533 C.E. Apostle to the Frisians: Saint Willibrord, 657–738 C.E. Apostle to the Gauls: Saint Irenaeus, 130–200 C.E. Apostle to the Gauls: Saint Martin of Tours, 338–401 C.E. Apostle to the Georgians: Saint Nino, 320s C.E. Apostle to the Gentiles: Paul. Apostle to the Germans: Saint Boniface, 680–755 C.E. Apostle to the Goths: Bishop Ulfilas. Apostle to Hungary: Saint Anastasius, 954–1044 C.E. Apostle to India: Saint Thomas, died around 72 C.E. Apostle to India: Saint Francis Xavier; 1506–1552 C.E. Apostle to India (Protestant): William Carey. Apostle to the "Indians" (Amerindians): John Eliot, 1604–1690 C.E. Apostle to the Indies (West): Bartolomé de las Casas, 1474–1566 C.E. Apostle to the Indies (East): Saint Francis Xavier, 1506–1552 C.E. Apostle to Ireland: Saint Patrick, 373–463 C.E. Apostle to the Iroquois, Francois Piquet, 1708–1781 C.E. Apostle to Noricum: Saint Severinus. Apostle to the North: Saint Ansgar 801–864 C.E. Apostle to the Parthians: Saint Thomas. Apostle of the Permians: Saint Stephen of Perm, 1340–1396 C.E. Apostle of Peru: Alonzo de Barcena, 1528–1598 C.E. Apostle to the Picts: Saint Ninian, fifth century C.E. Apostle to the Polish: Saint Adalbert of Magdeburg. Apostle to the Pomeranians: Saint Otto of Bamberg, 1060–1139 C.E. Apostle to the Scots: Saint Columba, 521–597 C.E. Apostle to the Slavs: Saint Cyril, 820–869 C.E. Apostle of Spains: James the Great, died 44 C.E. According to the Book of Mormon, shortly after Jesus’s Resurrection, he visited a group of people living in the Americas and chose 12 men to support his church in that region. These men were not called "apostles" in the text, but rather "disciples," as there were already apostles in Jerusalem. Although separated geographically from the Apostles, these New World disciples were nonetheless considered subordinate to the Old World Apostles (at least in a spiritual sense, if not, for practical reasons, administratively. See 1 Nephi, 12:8-10). The disciples in the Book of Mormon had the responsibility of caring for the Church in the Americas. Their names, according to 3 Nephi, 19:4, were Nephi, Timothy, Jonas, Mathoni, Mathonihah, Kumen, Kumenonhi, Jeremiah, Shemnon, Jonas, Zedekiah, and Isaiah. According to the book, nine of the 12 died of old age, and three (an unidentified subset of the 12, who would become to be known as "the Three Nephites") remained on the earth, as did John the Revelator, without "tasting death," to await the Second Coming of Jesus. The Roman Catholic and Eastern Orthodox Churches see bishops as the successors to the Apostles. Many Charismatic churches consider apostleship to be a gift of the Holy Spirit still given today (based on 1 Corinthians 12:28 and Ephesians 4:11). The gift is associated with church leadership, governing, delegation, and church planting. The Church of Jesus Christ of Latter-day Saints believes that the authority of the original Twelve Apostles is a distinguishing characteristic of the true church established by Jesus. For this reason, it ordains apostles as members of its Quorum of the Twelve Apostles, second in authority to the church's First Presidency which is led by the senior apostle, similar to Peter, leading the twelve disciples. The New Apostolic Church believes also in the current existence of modern day apostles. They believe in the return of the apostles in the 1830s in England. Among the many renewal movements in the 1800s, the New Apostolic Church split off from the Catholic Apostolic Church. Other examples of renewed churches include the United Apostolic Church. ↑ Catholic Encyclopedia, The Brethren of the Lord. Retrieved June 28, 2007. ↑ Catholic Answers, Peter and the Papacy. Retrieved June 28, 2007; The Knights of Columbus, The Catechism of the Catholic Church I. Retrieved June 28, 2007; The Knights of Columbus, The Catechism of the Catholic Church II. Retrieved June 28, 2007. ↑ The Knights of Columbus, The Catechism of the Catholic Church III. Retrieved June 28, 2007; Akin, James, Israel and the Church. Retrieved June 28, 2007. ↑ Akin, Jimmy, Successors of the Apostles. Retrieved June 28, 2007; The Knights of Columbus, The Catechism of the Catholic Church III. Retrieved June 28, 2007; The Catechism of the Catholic Church I. Retrieved June 28, 2007; Libreria Editrice Vaticana, Catechism of the Catholic Church. Retrieved June 28, 2007; Libreria Editrice Vaticana, Compendium of the Catechism of the Catholic Church. Retrieved June 28, 2007. ↑ Apostolic Succession. Retrieved July 3, 2007. ↑ Peter and the Papacy. Retrieved July 3, 2007; Peter the Rock. Retrieved July 3, 2007. ↑ Henry, Matthew, Matthew Henry Complete Commentary: Romans 16. Retrieved July 3, 2007. ↑ Schaff, Philip, History of the Christian Church. Retrieved July 3, 2007. Hanson, K. C. The Galilean Fishing Economy and the Jesus Tradition. New Advent Catholic Encyclopedia. Apostles. This page was last modified on 9 April 2016, at 16:18.